For over nine months the State of Florida has sought access to the Systematic Alien Verification for Entitlements (SAVE) database maintained by the Department of Homeland Security (DHS) in an effort to verify eligible voters and clean up the voter rolls of ineligible voters.On May 31, 2012 the Department of Justice sent a letter to the Florida Department of State, questioning the efforts of the state to protect the integrity of the election process. On June 6th, Florida Secretary of State Ken Detzner responded to the Civil Rights Division of the Department of Justice, challenging its assertions that federal law prohibits Florida from verifying the eligibility of voters and removing non-citizens from its voter rolls in violation of the Voting Rights Act and the National Voter Registration Act (NRVA). Secretary of State Detzner asserts that the State of Florida has followed the procedures as set forth in Section 98.075 of the Florida Statutes, which procedures have been pre-cleared by the Department of Justice. Detzner’s letter continues “By denying Florida access to the SAVE database, DHS appears to have violated federal law, which provides that states may use the SAVE database for any legal purpose such as… voter registration,” and that “DHS shall respond to an inquiry by a State… government agency… seeking to verify or ascertain the citizenship or immigration status of any individual within the jurisdiction of the agency for any purpose authorized by law, by providing the requested verification or status information.” 76 Fed. Reg. 58525, 58527 (Sept. 21, 2011); 7 U.S.C. 1373(d). Secretary Detzner also requested confirmation from the Department of Justice if its policy prohibits the state from accessing the SAVE database and obtaining information to identify non-citizens on the rolls for later removal, if they cannot be purged before the November 2012 election. In summation, Secretary Detzner seeks to clarify if it is the practice the Department of Justice to allow the Department of Homeland Security to violate federal law by allowing it to delay for months requests for access to the SAVE database by the state of Florida, or any other state, so that the Department of Justice can in turn assert that the state is in violation due to the time period (90 days) established in another federal law. In the past few weeks, over 180,000 individuals have been identified as possible non-citizens and are therefore not eligible to vote. This is a sizable amount, and could very well affect the outcome of the election. As it stands, the Department of Justice, under the direction of Attorney General Eric Holder, has displayed incredible arrogance in responding to requests from the state of Florida to assist in providing access to the necessary database to properly complete and establish the integrity of the voter rolls in the state. 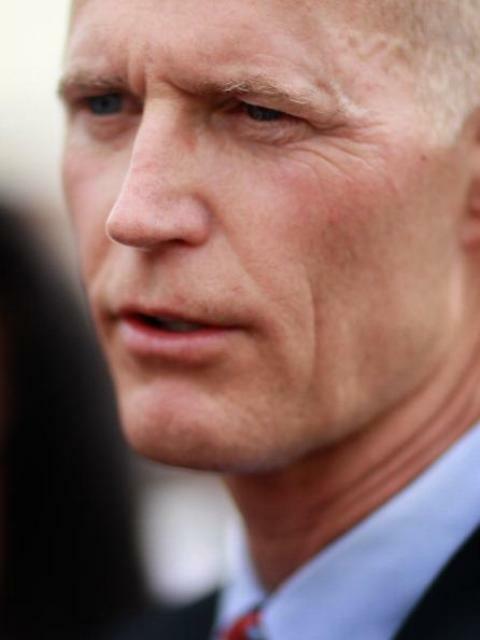 Florida Governor Rick Scott has stated that Florida will file suit against the Department of Homeland Security to provide access to the SAVE database. Governor Rick Scott speaks with Neil Cavuto from Fox News here.